You know the expression two wrongs don’t make a right? Well what if it is more like fifteen wrongs? There is so much wrong going on in this piece that it feels so right. Nips are being suckled, upchuck made of machinery flows across the canvas, and Mrs. Piggy has suspiciously blood shot eyes. It feels taboo, but in the world of Keith Haring, crass, inappropriate, and politically volatile imagery is embraced with open arms and ultimately reigns supreme. To understand Keith Haring's work, you must be willing to decode the deeply entrenched semiotics that rule over his imagery. For most, the image of a pig elicits thoughts of the farm, or maybe even the police, but for Haring, the pig meant something a little different. 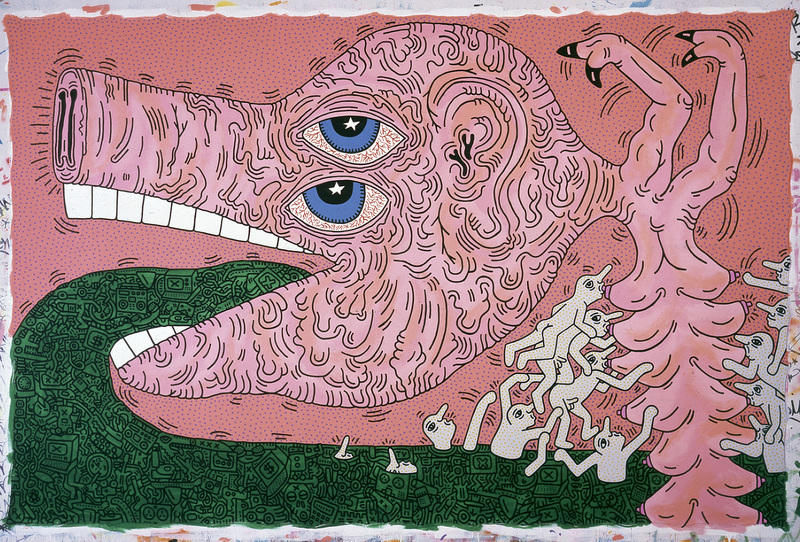 Haring’s pigs tend to represent greed, and this work in particular is a critique of the excess of capitalism. Men born of her money-green machinery-filled vomit are sucking this overworked pig dry. It seems as though no one will win this cyclical battle, which in a way is the perfect critique of capitalism. Haring had mad beef with the trajectory that he saw contemporary culture going and was not afraid to project his beliefs through his artwork. Rife with messages of social justice regarding environmental degradation, racism, and technological doom, Haring used his art as a cry for people to wake up. Gay is okay, greed and hate are not is the general gist of Haring’s oeuvre. Some may call the whole anti-greed commentary a bit ironic as Haring is often seen as one of the art world’s number one sellouts. Starting in the underground labyrinth of the New York City subway system, Haring’s work quickly became so popular that the artist decided to ditch his underground haven and open up his very own retail store. Opening the Pop Shop in 1986, Haring began to sell everything from buttons and shirts to skateboards and prints of his artwork. Naturally, many became suspicious of his motivations. He was constantly critiquing capitalism and greed, as we can see in this painting, yet he was slinging his work like the best of businessmen. Haring claims it was his way of combating the high prices his work began fetching on the art market, but it doesn't change the fact that he completely commercialized his artwork. So here we are asking the same question again: can two wrongs make a right? Either way, I think we should give the guy a break because at the end of the day, he was just a product of the system he was trying to change. Cognitive dissonance, anyone?